Are you bad about marking books “to be read” or “want to read” and forgetting about them? When was the last time you reviewed your entire TBR pile only to find some were placed on the list 3, 4 or 5 years ago? Well, we know exactly how you feel. We have bookshelves filled with hundreds of books that have just been sitting and collecting dust year after year... Others we talked to said they also have a lot of books they haven’t read yet. A few months, we decided to dust some of them off and start reading. We told friends what we were doing, and they agreed they needed to start reading their older books as well. So we figured we all could use some help with getting our butts in gear and reading our TBR titles marked over a year ago. Take a bite out of as many books you’ve marked “to read” during the past few years as possible from Jan 1, 2015 to Dec 31, 2015. · Since this is a romance blog, at least 80 percent of what you read for the challenge must be romance (including all the romance sub-genres) novels or novellas. The remaining 20 percent may be non-romance titles (for example urban fantasy, fantasy, science fiction, mainstream fiction, mystery, horror, etc.). · The books you read must have been marked “to be read” or bought “to be read” prior to 2014. So, if you marked a book “to read” or bought a book during 2014, those books do not count. The book(s) must have been marked, or bought, “to be read” during 2013 or earlier. · Audio, novellas, novels, and library rentals are allowed. · You can join at any time during 2015. 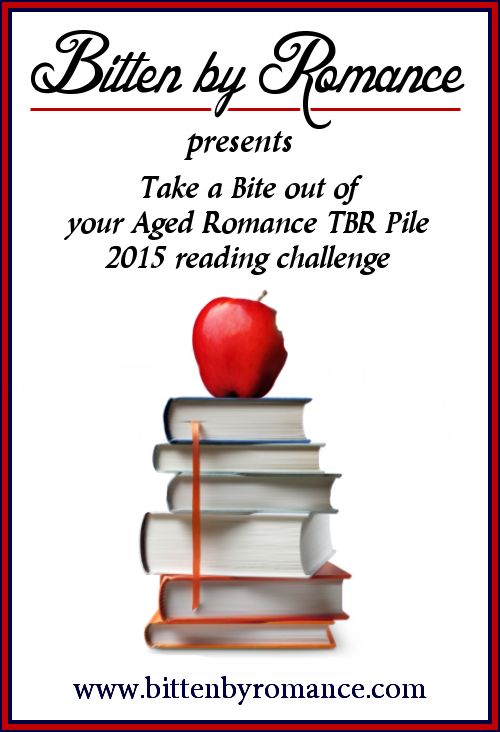 All of your aged TBR pile books read in 2015 count towards the challenge regardless of when you sign up during the year. · This challenge can crossover with other challenges. · You don’t have to have a blog to join, but if not, you must use Goodreads, Amazon, LibraryThing, etc, and add the URL to where you track your books. All you have to do is create a shelf for the challenge and then add that URL with your name in the linky below. · Goodreads shelf example: The link below is for one of the books on one of our Goodreads bookshelves we’re reading for this challenge. The book was added “to read” back in Feb 2010. You can join our Facebook challenge event to keep track of who is reading what for the month. We know we are not the only ones with this problem, so join us during 2015 and take a bite out of your TBR pile. Good motivation to revisit those lost gems on my list! Signed up! Even more motivation to get those books read now. Love this challenge. This was my goal this year to take a big bite out of my TBR list. I keep a physical list along with Goodreads and its truly edging into novel territory. We hope you can take a huge bite out this year. Thanks for signing up and we hope you have fun. You and me both. LOL. Thank you for signing up and we hope you have fun. Thanks for signing up Lizzie. We hope you have fun. Thanks for signing up, Soxie. We hope you have fun.